Getting a raid on Twitch is the ultimate jumpstart. A Twitch raid gives you the opportunity to suddenly grow your average viewers, your followers and explode the awareness of who you are, what you like, what you do and why you do it. 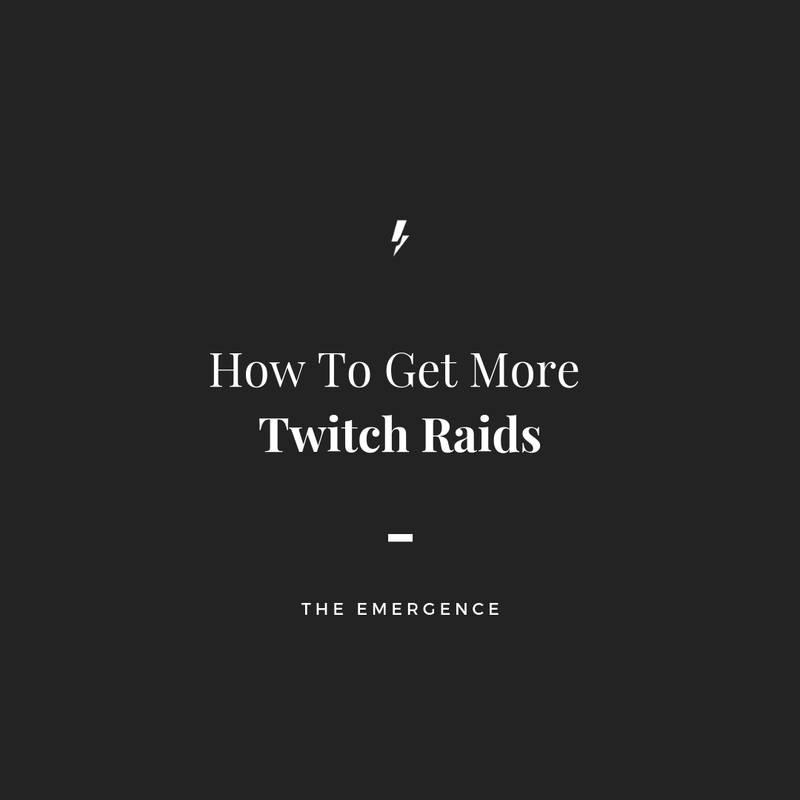 Knowing how huge this can be for a streamer, learning how to get more raids is a common thought and commonly-asked question. One thing you’ve got to remember with raiding is that the majority of viewers are going to leave very quickly, so you have an extremely short amount of time to convince them to stick around or come back another time. Later in the guide, I’ll explain what you should do if you get raided. It always comes back down the classic ‘be consistent’, the more you are online and streaming, the more likely somebody is going to spot you, and/or decide to host you. But while you could be streaming Fortnite 45 hours a week, it still doesn’t mean you’ll be spotted among the thousands of other streamers. Being aware of your surroundings (how popular the game you are playing is, the common trends in when it is played — and viewed — and jumping on a new game or an old game with a big update/hype around it) is incredibly important to increase your chances of a random and viral raid. The biggest reason somebody is going to raid (or host) you is because you are their friend and they want to help you. Therefore the best way to encourage this is to make more friends. Engage with other streamers and their streams, naturally develop friendships like you would in real life. I’m not recommending that you try and be everybody’s best friend, see them as ‘transactional’ only and jump into everyone's stream asking to be their “BFF’S 4EVER” — that’s not what you would do in real life is it? You want to start naturally building friendships with other streamers and content creators, ask them how they are, talk about the games they like to play or the current meta. Get to know them as a real person outside of Twitch, Discord or Steam. If it doesn’t feel right, natural or they aren’t keen, then do what you’d do in real life with somebody you met at school, college, uni, a coffee shop, work or at a party. So, don’t go into their chats and spam ‘raid me pls’ or ‘please be friends so you can follow me’, that’s not real, and you’d never do that in real life at a friend’s house? What should I do if I get raided? If you are being raided, there are many things you should do, a few you could do, and ultimately no rules to why you do them. If it fits the style (brand) of your stream and it’s authentically you, then you’ve gotta’ do it! Thank the raiding streamer and their new viewers for raiding you, it’s an incredibly exciting moment and you want them to feel the love as much as you currently do. If you know the streamer raiding you, ask them how their stream was going, talk about what you love about their content and their community. It’ll make them feel warm & fuzzy inside and potentially make them want to do it more! Engage with the new viewers, ask them questions and gently bring them into your community’s common discussion points. BTW; these rules definitely apply to a big host too.